Located at #277.5 Augusta Ave. Toronto, Ont. As of fall 2012, The White House Studio Project is now under new management. This website and blog will act as a database of documentation of the old White House, it’s projects and happenings. The information listed on this site is now out of date and just left as a relic to the old days. On behalf of the old board of directors I’d like to thank everyone who has participated, contributed and attended the White House over the past 3 years. Thank you for making it some of the best years of my life. Ex-White-House-board member Vanessa Rieger is curating Ghost Hole again and this year it is on Toronto Island! Showcasing over 30+ artists, some of them being White House members, and other local talents, transforming the Artscape Gibraltar Point Public school for one night only!!! For this one-day only event, the school will come to life, or rather, rise back from the dead. Artists will act as necromancers and use their power of art, installation, sound, video and performance to activate the space and open gateways into strange new worlds! 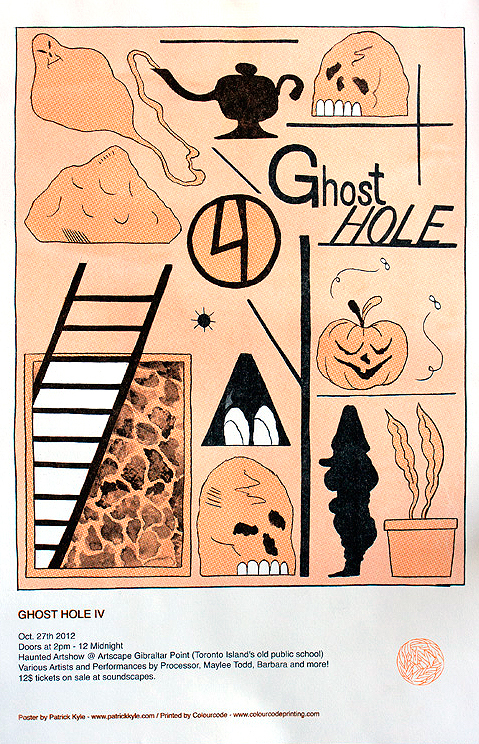 Some things you may encounter on your visit to Ghost Hole IV: Sculptures made by poltergeists, a haunted outhouse, bodies on the beach, boobie traps in the woods, ghostly children under the floorboards, altered states of reality, floating apparitions and historical building tours led by ghostly faculty. but once the sun goes down things get a lot darker! Performances by Maylee Todd (Maloo), JAL, Processor, Barbara, Sunken Skulls, Dune Buddies and comedy by Nick Flanagan. 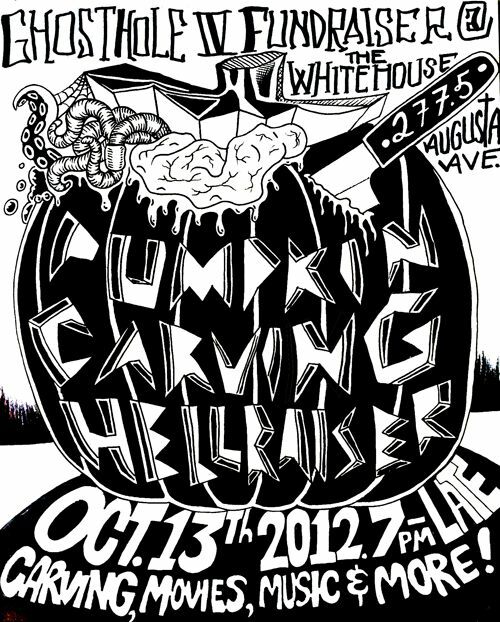 Posted on October 8, 2012 | Comments Off on PUMPKIN CARVING HELLRAISER! Bring your own pumpkin or buy a pumpkin. as well as specialty Halloween treats! Dodgy Disco spinning funky post-disco pre-house vinyl to get you dancing. Going till late late late!!!! Stay till the end of the night when we’ll carry pumpkins to Murder Park for some good ol’fashioned PUMPKIN SMASHING! Comments Off on PUMPKIN CARVING HELLRAISER! the White House will be holding a silent auction to help pay off our debts. The whitehouse is facing an outstanding property tax+hydro bill debt of $3800. Times are chaging and a lot of original members are moving on and would like to leave the project debt free. Many have used the whitehouse over the years for a multitude of purposes and its been really great. I would love everyone to come together now to celebrate it by helping raise funds to end the project on a positive note. ALL MONEY WILL GO TOWARDS THE DEBT. Studio Member James Fowler has curated another year of the 10×10 photography exhibition showcasing Toronto’s queer creative scene. On the strength of a resoundingly successful inaugural year, 10×10 has cemented a new yearly tradition of inviting ten queer Canadian photographers to take ten portraits of LGBTQ Canadians who have contributed to the arts. These 100 portraits celebrate those who share their talents and creativity through various art forms, as well as those who work behind the scenes to support the arts. For its sophomore outing, the 10×10 Photography Project has assembled a new roster of ten LGBTQ photographers with varied professional backgrounds and diverse approaches to portraiture. They focus our attention on some of Canada’s leading creative minds and arts professionals, shining a light on tomorrow’s brightest stars. Some of the subjects featured in this year’s exhibition include: Kristyn Wong-Tam, Vivek Shraya, David Dixon, Daniel MacIvor, Salah Bachir, Rae Spoon, Johnny Forever, Andy Fabo, Elle Flanders, Christopher House, Damion Nurse, Zoe Whittall, Ed Pien, Sook-Yin Lee, Deb Pearce, Diane Flacks, Ann-Marie MacDonald, Shauna Dempsey, Jamie Angell and many many more!! Studio member Vanessa Rieger is now on the Board for Whippersnapper gallery and is helping out with the New Traditions art and music festival. June 30th, 12noon – 11pm. 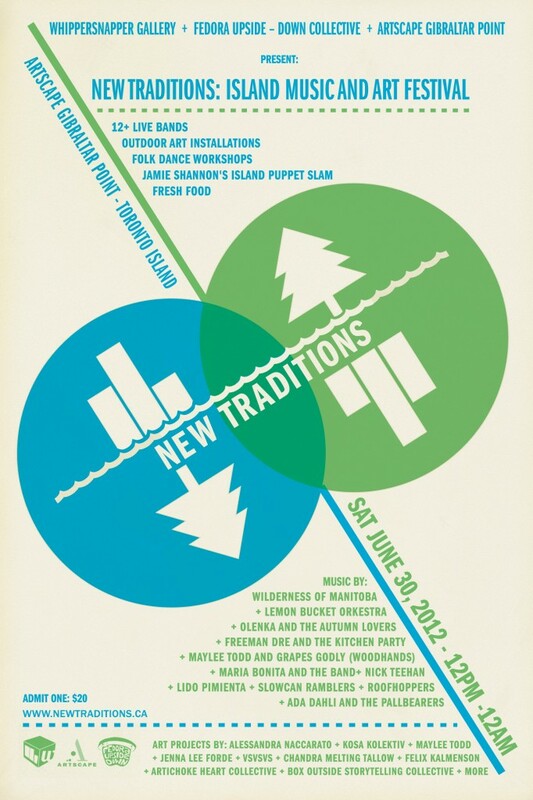 The first annual New Traditions: Island Music and Art Festival will be held on the beautiful grounds of the Artscape Gibraltar Point on the Toronto Island on Saturday June 30th. This independent artist-run and family friendly festival will feature 12 straight hours of live music, site-specific outdoor art installations, performances, folk dance workshops, a puppet slam and feasts of fresh food. + featuring over 12 musical acts! Posted on May 30, 2012 | Comments Off on 3d photo! 3rd photo from inside The White House by Zak Tatham. Comments Off on 3d photo! 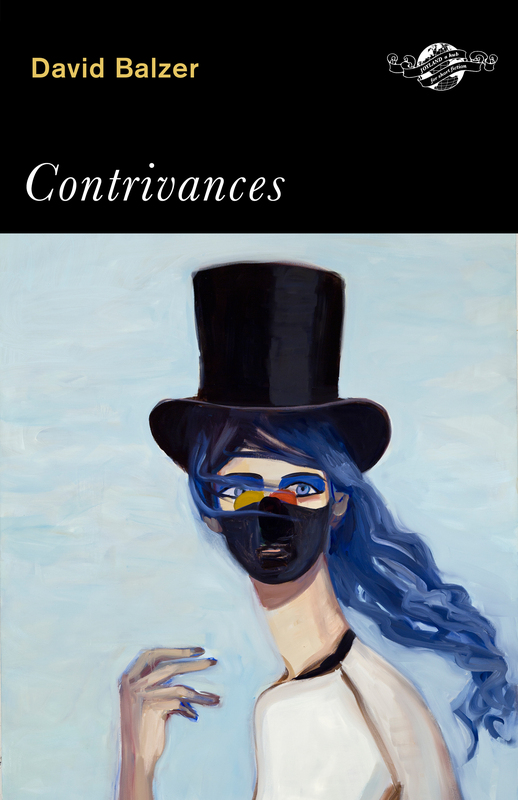 MELODRAMZ: A Night of Contrivances honours all manner of lavish gestures, flamboyant dress and states of distress in celebration of the launch of Toronto-based writer David Balzer’s new e-book of short stories, Contrivances (Joyland/ECW Press). Throughout the evening, there will be short readings—in drag—by Lauren Bride, Sean O’Neill, Liz Peterson, Bojana Stancic, Regina the Gentlelady, more. Between readings, reeraw (Sheroes) DJs. After the readings, dance your red shoes off with DJs Kevin Ritchie (Big Primpin), Luis Jacob (Love Saves the Day) and Balonius (Shakedown Street). Enjoy a unique array of gifs pertaining to the book, from Johnny Guitar to Jennifer Jason Leigh after-school specials, curated by reeraw and made by Helen Adamidou, Gaby Cepeda, Manuel Fernández, Tony Halmos, Georges Jacotey, Rollin Leonard, Grace McEvoy, Sally McKay, Rea McNamara, Lorna Mills, Chiara Passa, Yoshi Sodeoka and Giselle Zatonyl. Admission is $8 and includes a copy of Contrivances. Enter your email to stay updated with our project happenings.